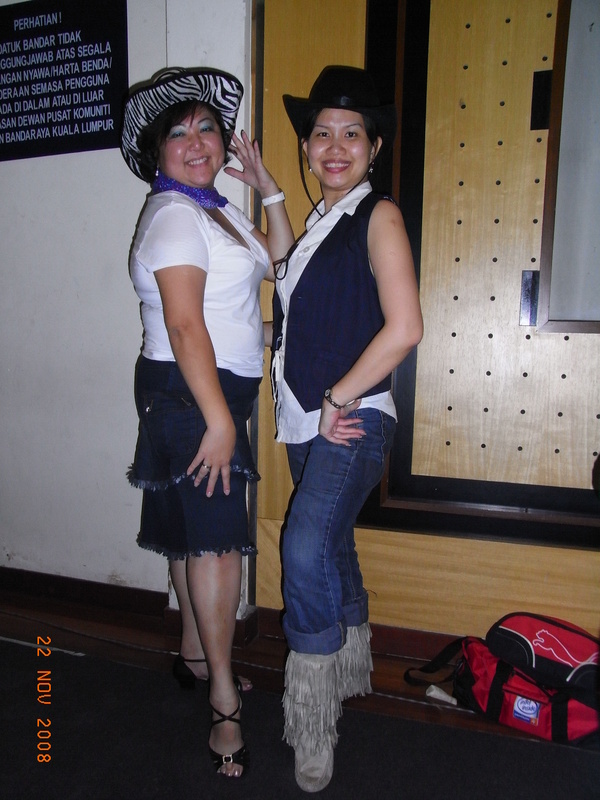 I was at TTDI for Funstompers’ Country Rocking Time last night. The whole dance list are filled with country songs, some old favourites and many forgotten dances (at least I hv forgotten them!) In the end, I only knew a handful of dances by heart such as Go Greased Lightning, Islands in the Stream, Kiss Me Quick, Jukebox, Oh Suzannah, One Heart, Rock Around the Clock, Sea Salt Sally and Siempre Cha Cha! I missed Black Horse as I walked in late! Aiya!! The others are done by picking up from the dancefloor, and trying to remember what I had learnt 3-4 yrs ago and of course, picking some new dances as well. Haha. Special guests for the night was Peter & Ee Lin from Yipee and Judy Teh from JB, who were on their way to Penang for the PISA event on Sunday (today). Judy Teh taught a dance called Saddle Up Shawty by Guyton Mundy which was fun, although Desmond and I had learnt it b4, we had a great time doing Yee Har! No music was played during dinner time else the dancers will not eat at all and dance the night away! Indian briani rice with fish curry, chicken curry, dhaal, fried chicken and papadum was served with rose syrup. The most celebrated man of the night was the man holding the papadum tray, LOL, as everyone wants an extra serving of papadum. When he walks into the hall with a trayful of papadums, the whole hall was clapping for him. He must have felt like a star that night! Margaret Lee went around the hall asking if we’ve seen Crocodile Dundee and everyone said no. She then pointed to her Crocs and her cowboy hat and said, Crocodile-Dundee! LOL, everyone had so much fun that night! Although arriving late, I had to leave earlier too, as I had to finish packing for a business trip to Singapore on Sunday (today) and to finish the domestic chores for the week! I’ll be meeting with more dance friends in Singapore, hopefully!